I surely hope you have entered multiple upon multiple amounts of times for the Sparkle Louder contest. I mean, you can win a girl's night in New York City, at Times Square on New Year's Eve. Talk about the best party scene and the best way to enter the New Year with some sparkle. If you are just joining the convo about the Hpnotiq SparkleLouder contest, let me give you the 411. 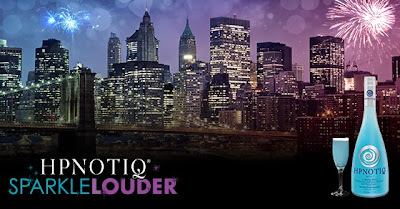 Hpnotiq’s SparkleLouder contest runs from November 4 through December 8, 2013! All you have to do is upload a pic, add a little sparkle (purple, blue, white!) of any design you choose, add a quote if you choose then ether to win! Every entry gives you more weekly chances to win one of 20 EFFY Diamond & Blue Topaz Rings Sweepstakes Prizes (four each week)! They look a little something like this. The app and contest entry can be found here: http://www.hpnotiq.com/SparkleLouderContest. And be sure to use #SparkleLouder when sharing all your fun pics on social media! Last New Year I was ringing in our wedding year with my fiance and I can't believe how the year has already flown by to us ringing in the New Year as husband and wife! As much as I would love to be joining the lucky winner in NYC, as per us our plans are very last minute. We might end up at my BFFs again, where we will down 12 grapes at midnight and make a wish. Or maybe we might shake it up and venture off somewhere new. But either way, what would New Year's Eve be without a little Hpnotiq cocktail? No fun. That's what. Here are 2 of my favorite recipes and I just might be shaking up come NYE. Pour over ice, stir, and serve in a rocks glass. Rim with coconut flakes. Make sure to enter and seriously consider bringing me along for the fun!